The POA is a list of all of the goals for the entire 2015-2016 school year. 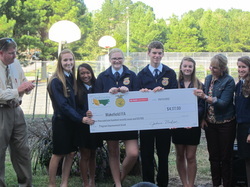 The FFA Officers spent a lot of time over the summer figuring out all of the fun activities that the FFA would participate in throughout the school year. As you can see from the attached POA below, the General Assembly meetings are always a fun and social time. This is a time when all FFA members are welcomed and encouraged to attend the meeting. In order to receive a FFA cord for graduation, you must attend 70% of those meetings for the last two years of your high school career. Find out more information about cord requirements and the application on the FFA Degrees page. There are a number of other activities and competitions throughout the year, as well. Sometimes these are for teams. If all members are invited to attend, there is an * that follows to let you know that the FFA wants you to be there. If there is not, this may be a competitive event with a trained team that is attending.